No Paparazzi Peas! Pea Soup Recipe. One cup of peas contains 9 grams of protein, 9 grams of fiber, 26% RDA of Vitamin A, 38% RDA Vitamin C, 14% RDA iron and zero fat! 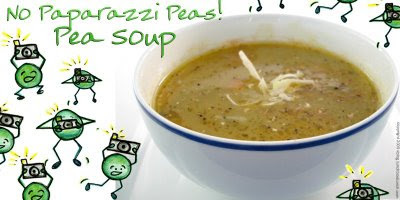 So here is a warm and hearty way to make your peace with peas: pea soup! Click on for my recipe for amazing No Paparazzi Peas! Pea Soup! In a sauce pan, add peas, broth, salt, pepper, cayenne, bay leaves and veganaise. Bring to a boil. Simmer for ten minutes, covered. Garnish with fresh parsley, fresh ground black pepper and a dollop of veganaise. Protein-rich: To add even more protein to this soup, add cubed boca spicy chik'n burgers to top of soup when served. Creamier: To make creamier soup: Substitute half of broth with soy milk. Add a few more scoops of veganaise.